A Vietnamese girl plants six lima beans in a Cleveland vacant lot. Looking down on the immigrant-filled neighborhood, a Romanian woman watches suspiciously. A school janitor gets involved, then a Guatemalan family. Then muscle-bound Curtis, trying to win back Lateesha. Pregnant Maricela. Amir from India. A sense of community sprouts and spreads. Newbery-winning author Paul Fleischman uses thirteen speakers to bring to life a community garden's founding and first year. The book's short length, diverse cast, and suitability for adults as well as children have led it to be used in countless one-book reads in schools and in cities across the country. Seedfolks has been drawn upon to teach tolerance, read in ESL classes, promoted by urban gardeners, and performed in schools and on stages from South Africa to Broadway. The book's many tributaries—from the author's immigrant grandfather to his adoption of two brothers from Mexico—are detailed in his forthcoming memoir, No Map, Great Trip: A Young Writer's Road to Page One. And don’t miss Joyful Noise: Poems for Two Voices, the Newbery Medal-winning poetry collection! 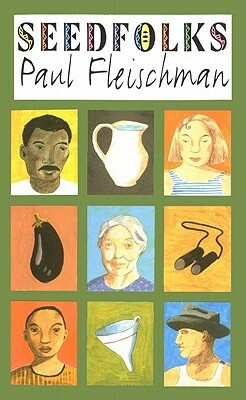 Paul Fleischman's novels, poetry, picture books, and nonfiction are known for innovation and multiple viewpoints. He received the Newbery Medal for Joyful Noise: Poems for Two Voices and a Newbery Honor for Graven Images, and he was a National Book Award finalist for Breakout. His books bridging the page and stage include Bull Run, Seek, and Mind's Eye. For the body of his work, he's been the United States nominee for the international Hans Christian Andersen Award. He lives in California. www.paulfleischman.net.